Here is a guide on how to use the DISQUS Comments system. It can be used by both GDM members and Guest/Public. GDM has had a Disqus account since 2014, though we've only just reactivated it, considering that technology has moved onward in four years. Disqus is one of the major commenting platforms on the web. If you're a web surfer of repute, it will be hard to miss their presence on websites the world over. Just looking at it should be familiar to most of you. We have included Disqus as a code block that will sit underneath the Members Comments and Star Ratings code blocks mainly in the Reviews/Articles pages. Refer to the section: Public Comments. 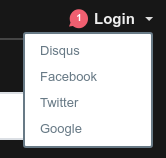 If you have either a Disqus user account, or a social media account through Facebook, Twitter or Google, you can login to those as well. You'll see the four social media icons displayed underneath. For members or those with accounts elsewhere, click on the LOGIN option. The dropdown box will allow which login account to use. Once selected and logged in, your account profile name will be displayed, and you can enter a comment and click submit upon completion. Also, we have made the Disqus Comment feature a public one, so if people don't want to register through the four options above, then they don't have to. Guests will, however, be required to enter a name (a pseudonym will do) and an email address. If you use a dummy email that will do too. 1) For guests, enter your comment, then go to the white field box with the term: 'Name'. 2) Click on it, two other fields will open. 3) Also, three checkboxes will display underneath. 4) You'll need to check all three. 5) As mentioned above, a name is required, so too an email address. 6) If you've checked the 'post as guest' you won't be required for a password. 7) Once this is done, click the right arrow out to the side. 8) Disqus enables the ReCaptcha authentication process, so click on the 'I Am Not A Robot' checkbox, work through the image grid/jigsaw thingy; once done, you'll be able to get your comment up into the GDM system. 9) Your comment should display as being posted, you can now leave the article page. Please respect the conditions of commenting, as mentioned in the code block.